Dr Cronin is a specialist in corneal transplant surgery. A Corneal Transplant or Corneal Graft involves replacing scarred, deformed or damaged corneal tissue with clear healthy tissue from a donor. The donor tissue comes from the Queensland Eye Bank. People who have passed away have generously donated their eyes so that someone else may enjoy good vision. This is a gift that must be taken seriously and looked after. The cornea does not have a blood supply. This means that it is not exposed to your immune system, therefore transplants are much less likely to reject than other organs like lungs or kidneys. Generally only steroid eye drops are required to stop the cornea from rejecting. The absence of an active immune system also means that healing occurs very slowly. Thus, it can take many months for vision to improve after corneal transplantation. A Penetrating Keratoplasty involves transplanting the full thickness of the cornea. 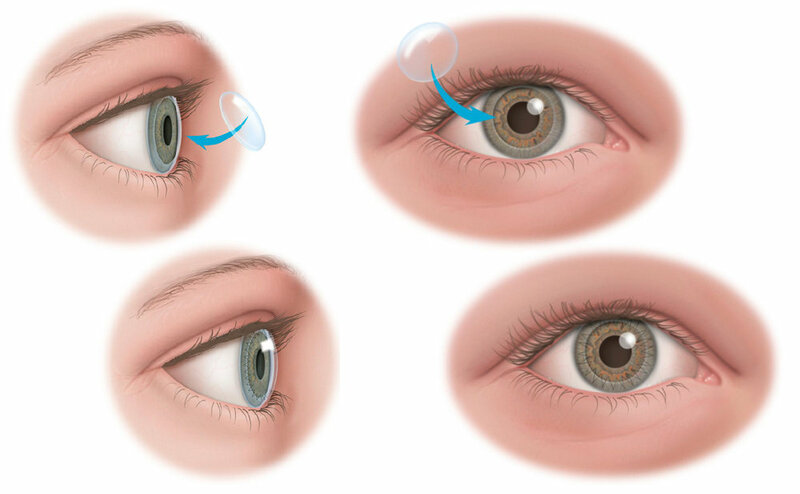 A circular blade called a trephine removes the central diseased cornea and a piece of donor cornea cut with a similar circular trephine is stitched in the defect created. Generally 16 sutures are used to stitch the transplant into place. These are left in place for at least 18 months to allow the eye to heal. The digrams below demonstrate a full thickness corneal transplant. Deep Anterior Lamellar Keratoplasty "DALK"
In this procedure all but the very deepest layers of the cornea are transplanted. The endothelium is the innermost or deepest layer of the cornea. It is also the layer that is most likely to cause rejection and degrade over time to cause graft failure. In a DALK the patient’s endothelium is left in place and the donors endothelium is removed before the graft is sutured into place. When performed successfully this extremely delicate procedure has a much lower rate of rejection than a full thickness transplant. Again, the stitches are left for approximately 18 months to allow the cornea to heal. Descemet's Membrane Endothelial Keratoplasty "DMEK"
This is almost the opposite of a DALK and it is almost always performed for a condition called Fuchs' Endothelial Dystrophy. In a DMEK the front layers of the cornea are not touched but the back surface, the endothelium, is transplanted. The transplanted endothelium is inserted into the patient’s eye through a very small incision and then it is floated into position with air. The recovery from this procedure is much quicker than with the other types of transplant and the final visual results are far superior to other types of surgery where the back layers of the cornea are transplanted. Dr Cronin has some instructional videos for surgeon's trying to learn these advanced transplant techniques here. All corneal transplants carry a life-long risk of the graft rejecting. This can happen at any time, even many years after the transplant surgery. The signs of rejection can be remembered as RSVP Redness, Sensitivity to light, Vision reduction and Pain. If you have a corneal transplant and you have these symptoms you must be seen to quickly so that steroid drops can be started to try and stop the rejection.